Kingdom Investment Ministry – The Kingdom is with you! 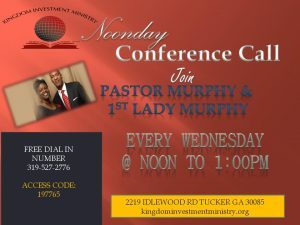 Kingdom Investment Ministry is awaiting you. It requires you to come and accept Jesus Christ as your Lord and Savior; providing excellence in culturally relevant Bible-centered preaching, teaching, contemporary worship and praise, conveying God’s love through the means of innovative and impactful ministries.